Farrell will be at the National Federation of the Blind’s Youth Slam 2011 in mid-July in Towson, Md., demonstrating the magic and math games he’s developed over the last 20 years. All his games and tricks are based on some kind of mathematics – group theory, geometry, symmetry, abstract algebra and more. But you needn’t be a math whiz to play. 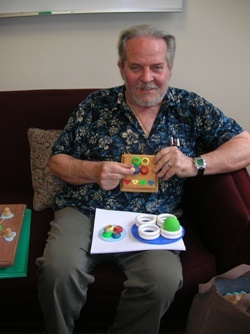 To demonstrate what he means, Farrell shows off one creation – a square block of wood with four raised colored circles. He calls it Klein’s Magic Square. The top two circles are green and yellow; the bottom two are blue and red. He instructs his subject to put a marble in one of the four circles, then move it vertically, horizontally or diagonally while calling out each move. As long as he knows where the marble starts or ends, he’ll be able to say, without looking, where the marble ends up. It’s magic, but it’s also math, illustrating that any number plus itself equals zero. Another game, which he calls Nimsy, features seven pegs and wood washers. The object is to be the last person to move your piece off the board. Then there’s one called Pappas – named for Pappas of Alexandria, a math genius who lived around 300 A.D. It’s a circular variation of tic-tac-toe where the players try to get three in a row in multiple possible ways – either a straight line, a circle or in the three different specially designed shapes in the board. Farrell, who’s been teaching at Butler for 45 years, said he started designing games for the blind in 1991 simply because he liked making up games. He showed his games to Butler Professor of Education Matt Maurer, whose brother, Marc Maurer, is president of the National Federation of the Blind. Matt Maurer was intrigued, and together he and Farrell tried out the games with some of the tech students at the Indiana School for the Blind, where they found an interested audience. Over the years, the National Federation of the Blind has invited him to demonstrate his work a number of times, in Louisville, Dallas and Detroit. Farrell said he hasn’t tried to market his creations, but he has 25 or so games and magic tricks in his repertoire. And his work is equally suitable for sighted people. He remembers one convention of international science students where he showed Nimsy to a group of fifth- and sixth-graders. which represents, say, H*V as H followed by V, and from the table it is the same as D. The things to remember most from the model are (1) X*X = 0 always, (2) X*Y = Z for non-0 entries and (3) any two successive plays always reduce to exactly one of the four symbols. Mathemagicians call this abstract algebra a group, and it has been around for nearly 200 years. Groups study symmetry wherever it occurs and there are uses for it in most branches of mathematics and physicists now use it in the study of quantum mechanics. Most models do not use OHVD but instead abstractly use 0123 instead. This leads the impish mathematician to exclaim that here “1+3=2 and 2+2=0,” startling most laymen.